Double-orifice mitral valve (DOMV) is an unusual congenital anomaly characterized by a mitral valve with a single fibrous annulus with two orifices or rarely two orifices with two separate mitral annuli opening into the left ventricle. 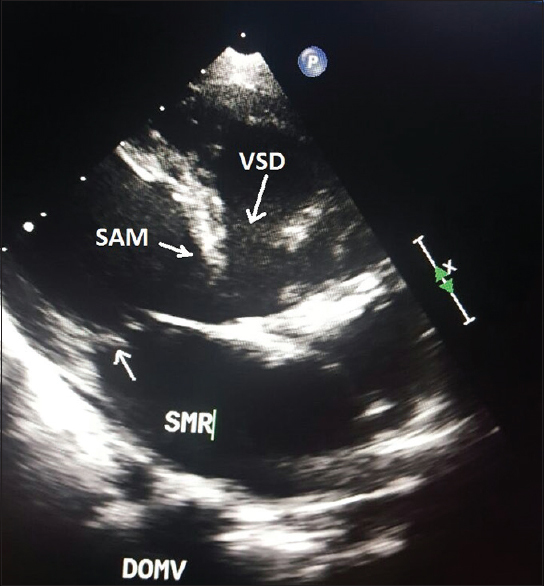 We present a first report of a patient with a DOMV with supramitral ring (SMR), subaortic membrane (SAM), a large ventricular septal defect (VSD) with more than 50% aortic override, and severe pulmonary arterial hypertrophy (PAH). This patient underwent excision of the SAM, and SMR, with closure of the VSD together under cardiopulmonary bypass (CPB). However postoperatively, the patient developed an irreversible fatal pulmonary hypertensive crisis (PHC), immediately after transferring the patient to the cardiac intensive care unit from the operating room (OR). The PHC was refractory to intravenous and inhaled milrinone and nitroglycerine and intravenous adrenaline, dobutamine, norepinephrine, vasopressin, patent foramen oval (PFO), and CPB support. The management of DOMV and perioperative pulmonary hypertension is discussed. Double-orifice mitral valve (DOMV) is a rare congenital anomaly that was first described by Greenfield in 1876. It can be either isolated or associated often with other cardiac anomalies like atrioventricular septal defect, coarctation of aorta, interrupted aortic arch, patent ductus arteriosus (PDA), primum atrial septal defect, tetralogy of Fallot, and ebstein anomaly., It may remain asymptomatic or rarely present with mitral regurgitation (MR) or stenosis (MS). However, DOMV with subaortic membrane (SAM) and supramitral ring (SMR) has not been described in the literature till date. We present here the perioperative and anesthetic management of a rare case of DOMV with ventricular septal defect (VSD), aortic override, SAM, SMR, and severe pulmonary arterial hypertrophy (PAH), which underwent excision of SAM and SMR along with VSD closure using cardiopulmonary bypass (CPB). 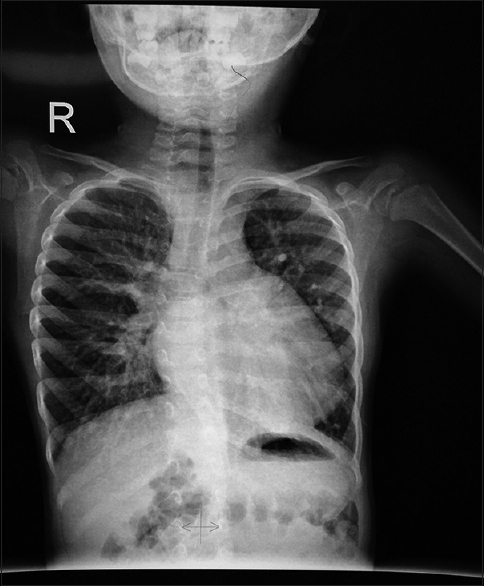 A 4-year-old male child, weighing 13 kg, presented with a history of recurrent fever, chest infection, and failure to thrive. Transthoracic echocardiography (TTE) revealed dilated left atrium (3.5 mm) and left ventricle. Left ventricular internal diameter end systole (LVIDDS 3.7), left ventricular diameter end diastole (LVIDd) (Z score + 2.2). Two-dimensional and three-dimensional imaging of mitral valve showed two separate valve orifices separated by a fibrous bridge. A SMR was present causing moderate MS (mitral valve area (MVA) 1.4 cm2), with a transmitral gradient of 12/8 mm Hg (maximum/mean). Mean gradients across right and left-sided orifice were 7.7 and 12 mm Hg, respectively [Figure 1] and [Figure 2]a, [Figure 2]b, [Video 1]. Right-sided orifice was connected to posteromedial papillary muscle and chordae tendineae from left-sided orifice were connected to anterolateral papillary muscle. A SAM, large subaortic VSD with bidirectional shunt and more than 50% aortic override were noted [Figure 3]. There was a small patent foramen oval (PFO) and severe PAH, [right ventricular systolic pressure (RVSP): 86 mm Hg]. Cardiac catheterization revealed oxygen saturation in various cardiac chambers; RA: 60%, RV: 60%, LA and LV 100%, with baseline arterial saturation of 98% and pulmonary to systemic blood flow ratio (Qp/Q s ratio of 2.8. His pulmonary artery pressure (PAP) was 90/57 mm Hg (SPAP/MPAP) against an arterial systolic blood pressure (BP) of 104 mm Hg confirming severe PAH. His PVR was 13.5 wood units (WU) that came down to 4.5 WU on 100% inhaled oxygen was inhaled. Electrocardiography revealed biventricular hypertrophy. Chest X-ray showed cardiomegaly with biventricular and pulmonary enlargement, along with prominent bronchovascular markings [Figure 4]. His hematological and biochemical values were with in normal limit. Based on echocardiography and cardiac catheterization data, the cardiologist suggested a complex congenital cardiac anomaly with borderline operability and poor outcome probability. Despite a very high-risk surgery, it was decided to give him a chance in view of reversibility of PAH. He was put on sildenafil (6.25 mg) orally 8 hourly and after a weak scheduled for emergency cardiac surgery using CPB. Parents were informed in detail about the complexity of the anomaly and a high-risk consent was obtained about the postsurgical outcome. In the operating room (OR), pulse oximetry and electrocardiogram (EKG) monitoring were started and inhalational induction with sevoflurane (5%–7%) in 100% oxygen was performed till intravenous access was achieved and then sevoflurane was switched off and anesthetic depth was increased with fentanyl (30 mcg), thiopentone (15 mg), and pancuronium bromide (1.5 mg) used to facilitate the endotracheal intubation with 4.5-mm ID cuffed tube. A 20-G catheter was inserted in left femoral artery for continuous BP monitoring and serial blood gas analysis. 5-french gauge triple lumen catheter was inserted via right internal jugular vein for CVP monitoring and administration of various medications. Anesthesia was maintained with intermittent use of sevoflurane, fentanyl, and midazolam. Heparin (50 mg) was used for anticoagulation to achieve an ACT >480 s. CPB pump was primed with 25% albumin (50 ml) and Ringer's solution (total 450 ml). Prophylactic phenoxybenzamine (1 mg/kg) was added to the pump to attenuate the metabolic acidosis and PAH and to facilitate the higher pump flows. Standard CPB technique (via mid-sternotomy) with moderate hypothermia (27°C) and potassium-enriched cardioplegic (Delnido) myocardial protection were used for intracardiac corrective procedure. Peroperatively, SMR, SAM, large subaortic VSD, small PFO, and bridge-type DOMV were confirmed [Figure 5]a and [Figure 5]b. On opening of the aorta, there was a normal trileaflet aortic valve and discreet SAM. The membrane was excised preserving the aortic valve. SMR was approached and excised via RA and PFO [Figure 5]a and [Figure 5]b. Mitral valve showed two orifices, which were unequally separated by a fibrotic band, and found to be normal on assessment without any stenosis or regurgitation [Figure 5]b. VSD was closed with Dacron patch in such a fashion that aortic over ride was also corrected. However, PFO was left open in view of severe PAH. The patient was placed on atriaventricular pacing (120 bpm) and weaned off CPB using dobutamine (2–5 mcg/kg/min), milrinone (0.5 mcg/kg/min), and nitroglycerine (1 mcg/kg/min) infusion and boluses of calcium gluconate (10 mg/kg) to achieve a target systolic BP between 60 and 80 mm Hg. Modified ultrafiltration (MUF) was also performed and around 400 cm3 water with solutes was removed from the patient. Immediate postbypass CVP was 6–8 mm Hg, left atrial pressure (LAP) was 11 mm Hg, and SPAP was 36 mm Hg (via direct PA line) against a systolic BP of 60 mm Hg. Anticoagulation was neutralized with protamine (50 mg). On visual assessment, RV contractility was normal without any ballooning. Surgical sites were checked for bleeding and chest was closed in usual fashion. Blood gas analysis before transfer to intensive care unit (ICU) revealed a pH of 7.35, PaO2 of 356 mm Hg, PaCO2 of 37 mm Hg, absolute base excess of −5.1, and HCO3 of 19.7 mEq/L. The aortic clamp time was 143 min, and the time of extracorporeal circulation was 164 min. Patient was transferred to cardiac ICU for elective ventilation. However, the child developed refractory bradycardia, hypotension, and cardiac arrest within 30 min of transfer to ICU. Cardiopulmonary resuscitation was initiated and patient transferred to OR and put again on CPB. Patient was in acute PHC crisis as PAP was suprasystemic; 65 mm Hg against a SBP of 45 mm Hg. So, intravenous epinephrine (0.1 μg/kg/min) and sildenafil (0.05 mg/kg/h), inhaled milrinone (80 mcg/kg) and nitroglycerine (2.5 μg/kg/min), and vasopressin (0.2 units/min) in the LA were also added. However, even with all this pharmacotherapy and prolonged CPB support, the PA pressures remained suprasystemic and hemodynamics could not be maintained. Extracorporeal life support (ECLS), inhaled nitric oxide (iNO), and right ventricular assist device (RVAD) were not available in the institute and he was unsuitable for intraaortic balloon counter pulsations (IABP) and pulmonary artery balloon counter pulsations. Unfortunately, repeated attempts of weaning from CPB failed and patient succumbed. DOMV is an uncommon congenital cardiac anomaly that was first described by Greenfield in 1876. The incidence of DOMV in the adult tertiary referral echocardiographic laboratory is estimated to be 0.01%. It is characterized by a mitral valve with a single fibrous annulus with two orifices that open into the left ventricle, each having an independ ent chordal attachment to the papillary muscle., In the literature, three types of DOMV have been recognized: (1) central or complete bridge type presents in about 15% of the patients of DOMV, in which a central fibrous bridge connects the two leaflets of the mitral valve that divides the orifice into medial and lateral, equal or unequal two openings, and the papillary muscles are usually normal. (2) Eccentric or hole type is the most common type present in about 85% of DOMV. It is characterized by a larger main orifice and a smaller accessory orifice situated at either the anterolateral or the posteromedial commissure. (3) Duplicate mitral valve type; it is characterized by two mitral valves with separate annuli, each with its own set of leaflets, commissures, chordae, and papillary muscles.,, In contrast, Sinha et al. have diagnosed 28 patients with DOMV by TTE in a retrospective study in 45,898 patients with an incidence of 0.06% and reported that 25 (89%) patients had complete bridge, whereas 3 (11%) had incomplete bridge type of DOMV. The DOMV can occur as an isolated anomaly or with association of other congenital heart defects. The frequently associated lesions are atrioventricular septal defect, VSD, coarctation of aorta, interrupted aortic arch, PDA, primum atrial septal defect, tetralogy of Fallot, ebstein anomaly, left-sided obstructive lesions, and moderate-to-severe MS and MR.,, Occasionally, it is observed with hypoplastic left heart syndrome, persistent left superior vena cava, unroofed coronary sinus, dysplastic tricuspid valve, double-orifice tricuspid valve, Shone syndrome, parachute mitral valve, flail mitral-valve leaflet, truncus arteriosus, pulmonary stenosis, bicuspid aortic valve, left ventricular noncompaction (isolated and nonisolated types), tricuspid atresia, and corrected transposition of great arteries.,, The mitral valve can function reasonably well in about 50% of patients with DOMV. In the other 50%, it can cause clinically significant MS or MR. However, our patient was a case of complete bridge type of DOMV that was associated with very rare cardiac anomalies like supramitral ring, SAM, VSD, PFO, and severe PAH, and such a combination has not been documented in the literature till date. This patient developed severe PAH and elevated PVR due to increased pulmonary blood flow via left-to-right shunt of VSD, PFO, and in addition, SMR obstructed the diastolic LV blood inflow, increased LA pressure and pulmonary venous pressure, and produced PAH, whereas the LV diastolic dysfunction due to SAM might also be the aggravating factor for PAH. The management depends on the anatomic abnormality in the mitral valve apparatus, associated anomalies, and clinical presentation of the patient. No surgery is necessary if DOMV is isolated and the mitral valve is competent without MS or MR. Surgical intervention is necessary when stenosis or incompetence is severe or if repair of an associated cardiac lesion is needed. However, association of DOMV with highly complex congenital heart defects and development of severe PAH makes the surgery prohibitive, as severe PAH has a significant impact on the outcome, especially when it is nearly systemic or supra systemic. Mubeen et al. have reported an operative mortality of 28.5% in patients with supra systemic PAP or high PVR. The authors have also suggested that mitral valve surgery is unsafe when PAP is more than 80% of the systemic pressure, as risk increases exponentially. Therefore, in patients with nearly or supra systemic PAH. assessment of reversibility of pulmonary hypertension is mandatory, as most of the studies have shown a greater risk of perioperative mortality rate in this subset of patients with nonresponsive PAH. A baseline preoperative pulmonary vascular resistance index (PVRI) of <6 WU/m2 and a pulmonary to systemic vascular resistance ratio <0.3 have been suggested as a favorable outcome indicator and patients can be subjected to cardiac surgery without undergoing inhaled NO or O2 challenge. Conversely, the vasoreactivity challenge is encouraged to assess the hemodynamic changes for operability in patients with PAH associated with CHD; the baseline PVR between 6 and 9 WU/m2, the PVR: SVR ratio 0.3–0.5, the post challenge decrease in PVR index 20%, PVR: SVR decreases by 20%, final PVR index <0.3, Qp/Qs >1.5:1, and basal saturations not <95% determine the operative suitability. Regardless of the specific anesthesia technique, optimization of RV preload, contractility, afterload (PVR), atrioventricular synchrony, and preservation of coronary perfusion pressure using vasoconstrictors and inodilators is necessary to avoid further exacerbation in PAP and RV dysfunction. Heavy premedication is not advisable and all cardiac medications should be continued up to the day of surgery. In addition to the standard American Society of Anesthesiologist monitors, simultaneous monitoring of systemic and pulmonary pressures permits the early detection of PAP elevation. Intraoperative pulmonary artery catheter and transesophageal echocardiography (TEE) are used to guide the fluid and drug therapy and potentially vital to troubleshooting hemodynamic instability. Therefore, continuous monitoring for RV decompensation with TEE is essential. Perioperative, continuous attention should be paid to the oxygenation, ventilation, acidosis, and volume status and anesthetic depth to avoid further exacerbation of PVR. Several mechanisms have been hypothesized for PHC following CPB; mechanical failure, pulmonary reperfusion syndrome, altered pulmonary endothelial function following CPB, and existing preoperative PHT may persist postoperatively, and even blood transfusions may exacerbate PHT, whereas hypoxia, hypercarbia, and pulmonary embolism are other causes of PHT. These can appear before, during, or after CPB. A PFO would be a right-to-left shunt; this would increase the severity of hypoxia and lead to an exacerbation of PHT. High levels of positive end-expiratory pressure may narrow the capillaries in the well-ventilated lung areas and divert flow to less well-ventilated or nonventilated areas, potentially leading to hypoxia. The care providers have to be more vigilant, and the strategies to reduce the PAP and PVR during perioperative period should be pursued. The ideal vasoactive agent to treat PHC would be one that maximizes pulmonary vasodilation, minimizes systemic hypotension, augments RV function, and increases cardiac output. In patients whose pulmonary vascular beds are responsive, inhaled pulmonary vasodilator therapies lower PVR without concomitant decreasing of SVR, and such agents are thus mainstays of PHC therapy. The AHA/ATS pediatric PH guidelines recommend iNO as a first-line agent in treating and preventing perioperative PHC. It improves ventilation/perfusion matching, decreases the intrapulmonary shunt fraction, and often increases the systemic arterial saturation. Moreover, it decreases time to meet criteria for extubation, incidence of PHC, and postoperative mortality.,, However, rebound PHC can occur on its discontinuation and requires a unique delivery system that might not be available in many institutes. The use of new pulmonary vasodilators and inotropes [milrinone, dobutamine, levosimendan] can substantially help such patients during and after the surgery. Some authors have suggested the use of inhaled milrinone, iPGI2 in presence of severe PAH, and RV dysfunction before and after the cardiac surgery and iNO and oral or intravenous sildenafil in cases of refractory PAH in ICU and documented a significant reduction in PHT indices as well as increase in CO and RV ejection fraction.,,,,,, A prospective pilot study of phenylephrine, arginine vasopressin, and epinephrine in pediatric patients with pulmonary hypertensive showed an increase in aortic pressure with all drugs, although only vasopressin resulted in a consistent decrease in the ratio of pulmonary-to-systemic vascular resistance. In patients unresponsive to vasodilator therapies, other options may be considered, such as atrial septostomy, MUF, pulmonary artery balloon counter pulsations, IABP, RVAD, ECMO, and also cavo-pulmonary diversion that have been described as potential treatments for severe RV dysfunction.,,, In these situations, a fenestrated closure of VSD with a 1-way flap may also be used to allow a R − L shunting and decompression of the failing RV, and the chest can be left open temporarily to reduce the surrounding pressures. Our patient falls in the category of highly complex congenital cardiac defects with severe reactive PAH, but developed acute PHC immediately post-CPB in ICU, that was refractory to various inodilators, inhalational milrinone, and nitroglycerine, and PFO, prolonged CPB support, optimization of ventilation, and vasopressors in the LA. The availability of prostaglandins, iNO, RVAD, or ECMO, might have prevented the unfavorable outcome. DOMV may be rarely associated with SAM, SMR, VSD, and severe PAH. A combination of these complex congenital cardiac defects may affect the surgical decision-making. Such patients may develop refractory suprasystemic PAH, potential for cardiac morbidity and mortality immediately after cardiac corrective surgery. So, the refractoriness of PAH should be assessed preoperatively using nitroglycerine or nitric oxide for amenability to possible cardiac surgery in congenital heart disease. The care-providing team should be more vigilant and aware of this fatal complication during perioperative period. Ideally, a cardiac surgery should be attempted sparingly and in a fully resourced cardiac setting. Greenfield WS. Double mitral valve. Trans Pathol Soc 1876;27:128-9. Taksande A, Goutami V, Thomas E. Double orifice mitral valve associated with ventricular septal defect in an infant: Case report. Images Paediatr Cardiol 2011;13:6-9. Das BB, Pauliks LB, Knudson OA, Kirby S, Chan KC, Valdes-Cruz L, et al. Double-orifice mitral valve with intact atrioventricular septum: An echocardiographic study with anatomic and functional considerations. J Am Soc Echocardiogr 2005;18:231-6. Wójcik A, Klisiewicz A, Szymański P, Różański J, Hoffman P. Double-orifice mitral valve-echocardiographic findings. Kardiol Pol 2011;69:139-43. Anwar AM, McGhie JS, Meijboom FJ, Ten Cate FJ. Double orifice mitral valve by real-time three-dimensional echocardiography. Eur J Echocardiogr 2008;9:731-2. Ozeke O, Ozbakir C, Gunel EN. Double mitral valve imaging. J Am Soc Echocardiogr 2010;23:340.e1-2. Trowitzsch E, Bano-Rodrigo A, Burger BM, Colan SD, Sanders SP. 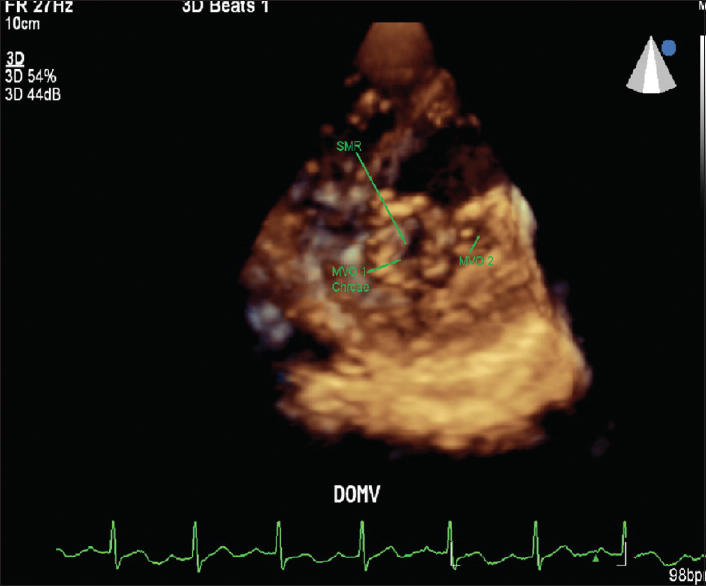 Two-dimensional echocardiographic findings in double orifice mitral valve. J Am Coll Cardiol 1985;6:383-7. Sinha SK, Mishra V, Singh K, Asif M, Sachan M, Kumar A, et al. Bi-luminal mitral valve: Incidence, clinical features, associated anomaly and echocardiographic evaluation. J Clin Med Res 2016;8:893-8. Zalzstein E, Hamilton R, Zucker N, Levitas A, Gross GJ. Presentation, natural history, and outcome in children and adolescents with double orifice mitral valve. Am J Cardiol 2004;93:1067-9. Yesilbursa D, Miller A, Nanda NC, Mukhtar O, Huang WY, Ansingkar K, et al. Echocardiographic diagnosis of a stenotic double orifice parachute mitral valve with a single papillary muscle. Echocardiography 2000;17:349-52. Sugiyama H, Hoshiai M, Toda T, Nakazawa S. Double-orifice mitral valve associated with noncompaction of left ventricular myocardium. Pediatr Cardiol 2006;27:746-9. Bano-Rodrigo A, Van Praagh S, Trowitzsch E, Van Praagh R. Double-orifice mitral valve: A study of 27 postmortem cases with developmental, diagnostic and surgical considerations. Am J Cardiol 1988;61:152-60. Goncalo F. Coutinho, Manuel J. Antunes. Surgery for mitral stenosis in patients with pulmonary hypertension: How far can we go?. J Thorac Cardiovasc Surg 2016;152:302-3. Mubeen M, Singh AK, Agarwal SK, Pillai J, Kapoor S, et al. Mitral valve replacement in severe pulmonary arterial hypertension. Asian Cardiovasc Thorac Ann 2008;16:37-42. Myers PO, Tissot C, Beghetti M. Assessment of operability of patients with pulmonary arterial hypertension associated with congenital heart disease – Do we have the good tools to predict success? Circ J 2014;78:4-11. Kaestner M, Schranz D, Warnecke G, Apitz C, Hansmann G, Miera O. Pulmonary hypertension in the intensive care unit. Expert consensus statement on the diagnosis and treatment of paediatric pulmonary hypertension. European Paediatric Pulmonary Vascular Disease. Network, endorsed by ISHLT and DGPK. Heart 2016;102:ii57–ii66. Taylor MB, Laussen PC. Fundamentals of management of acute postoperative pulmonary hypertension. Pediatr Crit Care Med 2010;11:S27-S29. Denault A, Deschamps A, Tardif JC, Lambert J, Perrault L. Pulmonary hypertension in cardiac surgery. Curr Cardiol Rev 2010;6:1-4. Kameny RJ, Fineman J, Adatia I. Perioperative Management of Pediatric Pulmonary Hypertension. Adv Pulmonary Hypertens 2016;15:87-91. Abman SH, Hansmann G, Archer SL, Ivy DD, Adatia I, Chung WK, et al. Pediatric pulmonary hypertension: Guidelines from the American Heart Association and American Thoracic Society. Circulation 2015;132: 2037-99. Adatia I, Lillehei C, Arnold JH, Thompson JE, Palazzo R, Fackler JC, et al. Inhaled nitric oxide in the treatment of postoperative graft dysfunction after lung transplantation. Ann Thorac Surg 1994;57:1311-8. Journois D, Baufreton C, Mauriat P, Pouard P, Vouhé P, Safran D. Effects of inhaled nitric oxide administration on early postoperative mortality in patients operated for correction of atrioventricular canal defects. Chest 2005; 28:3537-44. Solina AR, Ginsberg SH, Papp D, Grubb WR, Scholz PM. Dose response to nitric oxide in adult cardiac surgery patients. Clin Anesth 2001;13:281-6. Hache M, Denault AY, Belisle S, Couture P, Babin D, Tétrault F, et al. Inhaled prostacyclin (PGI2) is an effective addition to the treatment of pulmonary hypertension and hypoxia in the operating room and intensive care unit. Can J Anaesth 2001;48:924-9. Hache M, Denault AY, Belisle S, Robitaille D, Couture P, Sheridan P, et al. Inhaled epoprostenol (prostacyclin) and pulmonary hypertension before cardiac surgery. J Thorac Cardiovasc Surg 2003;125:642-9. Lamarche Y, Malo O, Thorin E, Denault A, Carrier M, Roy J, et al. Inhaled but not intravenous milrinone prevents pulmonary endothelial dysfunction after cardiopulmonary bypass. J Thorac Cardiovasc Surg 2005;130:83-92. Lamarche Y, Perrault LP, Maltais S, Tetreault K, Lambert J, Denault AY. Preliminary experience with inhaled milrinone in cardiac surgery. Eur J Card Surg 2007;31:1081-7. Fattouch K, Sbraga F, Bianco G, Speziale G, Gucciardo M, Sampognaro R, et al. Inhaled prostacyclin, nitric oxide, and nitroprusside in pulmonary hypertension after mitral valve replacement. J Card Surg 2005;20:171-6. Thunberg CA, Gaitan BD, Grewal A, Ramakrishna H, Stansbury LG, Grigore AM. Pulmonary hypertension in patients undergoing cardiac surgery: Pathophysiology, perioperative management, and outcomes. J Cardiothorac Vasc Anesth 2013;27:551-2. Siehr SL, Feinstein JA, Yang W, Peng LF, Ogawa MT, Ramamoorthy C. Ogawa; Chandra Ramamoorthy. Hemodynamic effects of phenylephrine, vasopressin, and epinephrine in children with pulmonary hypertension: A pilot study. Pediatr Crit Care Med 2016;17:428-37. Novick WM, Sandoval N, Lazorhysynets VV, Castillo V, Baskevitch A, Mo X, et al. Flap valve double patch closure of ventricular septal defects in children with increased pulmonary vascular resistance. Ann Thorac Surg 2005;79:21-8.